A piece of crown molding in my living room has shifted down leaving a gap. What is the best way to fill in the space? It may be a wast of effort to fill the space between the crown molding and wall or ceiling if the under-lying problem is left unresolved. Improperly secured crown molding will likely continue to shift with changes in temperature and humidity, rendering any effort to fill the gap unsuccessful. If you have a newer home the crown molding was probably installed with a pneumatic finish nail gun. It is not uncommon for nail guns to misfire or mis-align a nail, leaving the molding inadequately secured in that area. On older homes where the molding was hand nailed wood shrinkage may have caused a nail to loosen allowing it to shift. To permanently resolve the problem secure the loose crown molding using a finish nail or nails with a minimum length of 2-1/2 inches. 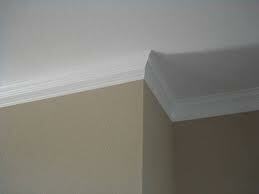 It is acceptable and even advisable to pre-drill the crown molding with a bit slightly smaller than the finish nail. Angle the drill approximately 55 degrees off the plane of the wall. Move the molding back into proper position if possible and drive the finish nail in until it is almost flush with the surface of the crown molding taking care not to mark the surface with the hammer. Use a nail set to finish driving the nail just below the surface of the molding. Once the crown molding is secured use wood putty to fill the nail holes and use a latex caulk to fill the crack. Cut the caulk nozzle at an angle and force the caulking into the crack without letting it build up on the surface. Using a damp finger and applying moderate pressure smooth the caulking out while pressing it into the crack. When the caulk has dried the repaired area can be painted. DO NOT use silicone on any area that will ever be painted as paint will not stick to silicone. This entry was posted in Caulking, Interior Maintenance, Questions and Answers. Bookmark the permalink.